Finally…two apple sauces, a pie, 3 crumbles, some pastries and one roasted pork later and that huge bag of hand picked apples is finished! Here are the last two apple inspired dishes, one sweet, one savory. I tried a few different versions of apple crumble and the best is outlined below, and I also roasted apples in the pan with a small pork roast for a savory apple application! I added some melted butter (1-2 tbsp), brown sugar (1/4 cup) and cinnamon (1 tsp) to large segments of 3 peeled apples, then tossed in a big bowl. I cooked them in the pan with the pork (even threw in some raisins and a peeled and quartered pear as well). I rubbed cinnamon, salt and pepper on the pork, then cooked the lot in a big roasting pan until the internal temp hit 145 degrees. Viola! a new way to use my fresh apples. Put all of the ingredients into a large bowl and mix. If you want a softened apple, cook for 10 minutes on medium heat. I just kept them raw and they had a bit of bite to them. Tip: For a bit of an unexpected flavor, take a large piece of crystallized ginger and cut it into tiny pieces and add to the filling. We give the kids crystallized ginger as a dessert, ginger is great for the immune so this candy is packed with some health benefits as well as satisfying a sweet tooth. Preheat oven to 350 degrees. Mix all of the above ingredients except the butter. Once mixed, take the butter from the fridge and cut it into chunks, add to the bowl and mix it with your fingers until it is incorporated into the dry ingredients and makes little peas. Pour the apple mix into a small pan (I used a white casserole pan, you could use an 8 inch square lasagna pan as well). Take the crumble in your fingers and drop on the top evenly. Bake for 30 minutes and then check, may need 5 or 10 more minutes. 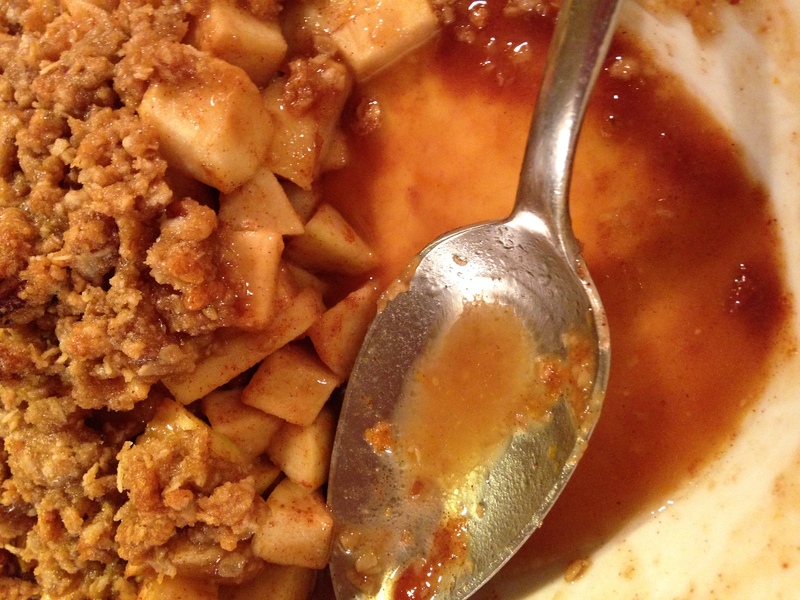 You will know it is finished when it is bubbling all around the edges and the crumble is browned.